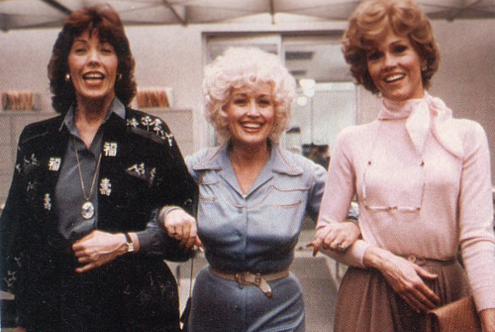 The 9 to 5 crew: Tomlin, Parton and Fonda circa 1980. Audience demographics be damned -- especially if you’re Netflix and you don’t release audience figures anyway. The “world’s leading Internet television network” announced Wednesday that it’s teaming golden agers Jane Fonda and Lily Tomlin in Grace and Frankie, a sitcom set to premiere next year. The premise isn’t entirely unlike TV Land’s Happily Divorced, whose star, Fran Drescher, learned that her husband is gay. Drawn from her real-life experiences with ex-hubby Peter Marc Jacobson, the comedy ran for two seasons before being canceled in August of last year. Thirteen episodes of Grace and Frankie have been ordered. As usual, Netflix will make them all instantly available for streaming on the series’ launch date. *** CBS’ Late Show with David Letterman, being badly hammered among advertiser-prized 18-to-49-year-olds in its New York-based face-off with NBC’s The Tonight Show Starring Jimmy Fallon, does not seem overly concerned with skewing old. The program has announced 89-year-old former president Jimmy Carter as its featured guest on Monday, March 24th. Carter will be touting his latest book, A Call to Action: Women, Religion, Violence and Power. Fallon also is going the former politician route, booking Arnold Schwarzenegger, hardly a youngster at 66 but still young enough to be Carter’s son. The ex-California governor’s promotional considerations are less lofty. He’ll be plugging his new action movie, Sabotage. ***In another old-timer development, FX has inked Billy Crystal, 66, to star in his first prime-time TV series since Soap. He’ll join Josh Gad (The Book of Mormon) in The Comedians, playing a “superstar veteran” comic paired with an “edgier up-and-coming” one. 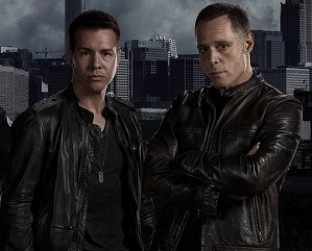 It’s due in 2015, with a 13-episode first season planned. Crystal was a regular on Saturday Night Live in the 1984-’85 season. ***Starting this fall, MyNetworkTV will be the exclusive broadcast network home for repeats of The Walking Dead. It’s currently the No. 1 scripted series in all of television among advertiser-coveted 18-to-49-year-olds. In D-FW, MyNetworkTV programming is carried on KDFI-TV (Ch. 27). CBS doesn’t mess around. The No. 1 network in total viewers banks on stability, not rampant change. So it’s renewed 18 prime-time series for next season, bringing the grand total to 20 after previous announcements on Survivor and The Big Bang Theory (which has a three-year deal that will take it all the way through the 2016-17 TV season). In situations like this, it’s easier to spotlight the ongoing series that haven’t yet made the cut. And that basically boils down to The Mentalist (winding down its 6th season) and two first-year shows -- The Crazy Ones (starring Robin Williams and Sarah Michelle Gellar) and Intelligence (with Josh Holloway of Lost fame). They’re still “on the bubble,” but in reality all but dead. How I Met Your Mother also won’t be back, but CBS announced a while back that this is its last season, with the finale set for Monday, March 31st. And it’s a foregone conclusion that two shows no longer breathing CBS’ air space have also breathed their last. Namely Hostages and We Are Men. The returnees include CBS’ most critically acclaimed drama, The Good Wife. Its ratings continue to be problematic but CBS still likes the show’s patina. Two series that seemingly entered this season with very iffy futures -- Hawaii Five-O and Two and a Half Men -- also will be returning. Hawaii Five-, shifted from Monday to Friday nights, has proven to be surprisingly resilient in a slot between Undercover Boss and Blue Bloods. One remaining new series, the comedy Friends With Better Lives, will be launched on March 31st after the How I Met Your Mother finale. Reckless, a freshman drama series announced as a midseason replacement last spring, has been pushed back to a June 29th premiere. After all the dust clears, CBS will have a maximum of six casualties from the ongoing 2013-14 TV season, which ends in May. And that’s only if Friends With Better Lives doesn’t make it. CBS has executed that game plan time and again while its rivals try to stop their merry-go-rounds. ABC in particular has been a revolving door of failure this season. The network has ample series still on the bubble. And its officially dead or intensive care list includes Lucky 7, Back in the Game, Betrayal, Once Upon a Time in Wonderland, Super Fun Night, Trophy Wife, Killer Women, The Neighbors, The Assets, Mind Games, The Taste and Mixology. That’s a lot of carnage. ***FX’s acclaimed Louie, starring Louis C.K., will launch its fourth season on Monday, May 5th with back-to-back episodes. FX says two new episodes will air each Monday through June 16th. Louie has been on a 19th month hiatus after Louie C.K. asked for more time to retool and re-charge. ***Another critically praised series, BBC America’s Orphan Black, will return on Saturday, April 19th with Season 2. ***Showtime has picked up the drama series pilot Billions, brainchild of Too Big to Fail author Andrew Ross Sorkin. Showtime says it deals with the “collision and, at times, collusion between an aggressive U.S. attorney in New York and some of the richest hedge fund billionaires in the country.” No cast has been announced yet. 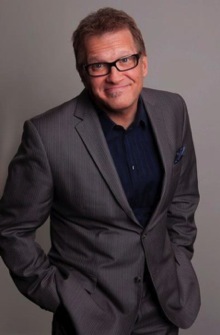 Just a hunch, but comedian/game show host Drew Carey would seem to be at a disadvantage opposite Olympic ice dancing champs Charlie White and Meryl Davis when ABC’s Dancing with the Stars returns for its 18th edition on Monday, March 17th. Via Good Morning America, ABC announced a dozen new hoofers Tuesday. The show also has a first-year co-host, ESPN’s Erin Andrews, and a “dramatic new twist” called The Switch Up. Viewers will make the calls, with contestants required to change professional partners at some point in the season. DWTS continued to fade in the prime-time ratings last season, particularly among advertiser-prized 18-to-49-year-olds. It now has a top-heavy older audience appeal -- at least as far as ABC is concerned. The show’s three charter judges -- Len Goodman, Carrie Ann Inaba and Bruno Tonioli -- will all return. ***On Monday’s Jimmy Kimmel Live!, the host announced his first batch of guests for the March 10-14 shows from Austin. He plans to welcome Willie Nelson, Gov. Rick Perry, Seth Rogen and Rosario Dawson among others. The shows are tied to the annual SXSW music festival.